Following recent reports that multiple police officers have been shot dead in Louisiana, many are wondering how to donate to the Baton Rouge police officer victims. On Sunday morning, three police officers were reportedly killed and three others wounded in an attack officials believe was carried out by multiple gunmen. According to local news, the shooting took place near the B-Quik gas station on Airline Highway near Old Hammond and occurred around 9 a.m. local time (10 a.m. EST). Officials reported that the scene had been contained by 12 p.m., and one shooting suspect is dead. Two possible suspects were detained by police Sunday afternoon. 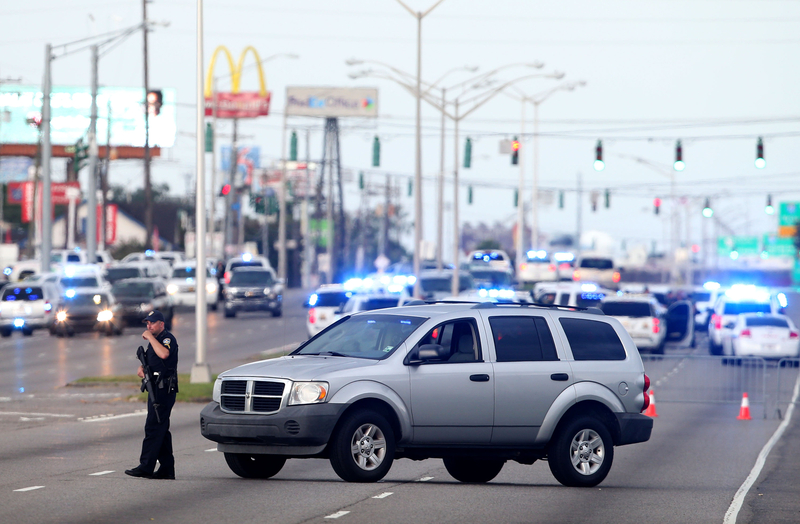 The shooting is the latest in a series of violent acts across the country, one of which also took place in Baton Rouge. On July 5, Alton Sterling was tackled and shot dead by police while selling bootleg CDs outside a gas station in the city. His death, along with that of Philando Castile the next day, sparked Black Lives Matter protests across the country. During one such peaceful protest in Dallas, Texas, a sniper shot and killed five police officers. It's unclear whether Sunday's shooting was directly connected to other incidents, but with each new act of violence, tension between police officers and civilians around the country has heightened. There are a number of ways to help the victims of the Baton Rouge police shooting that don't involve money. If you prefer to donate, however, here are a few nonprofits that aid police officers across the country. According to its website, Louisiana State Troopers Association is a nonprofit dedicated to "improving the working conditions of Louisiana's State Troopers, aiding Troopers in need and providing assistance to the citizens of our state through our many public service projects." To donate, check out its website. The Officer Down Memorial Page is a nonprofit that honors law enforcement officers who were killed in the line of duty. To donate, head over here. The National Law Enforcement Officers Memorial Fund is exactly what it sounds like: A nonprofit organization that memorializes fallen law enforcement. In addition to a monument in Washington, D.C., it has a variety of programs honoring police across the country. Check out its donation page here. If you don't have the funds to donate, you can always donate blood; shootings can cause blood shortages in hospitals. The Baton Rouge Red Cross falls under the state's western chapter, or you can find your local chapter here. Many of the above organizations are national, so they may not help the Baton Rouge police officers directly. However, crowdfunding website CrowdRise has a few legitimate fundraisers, like this one from the group Planting Peace. There is also a GoFundMe for slain Officer Montrell Jackson's family.